Classroom conversations often begin with questions, but too often the questions are posed by the teacher, the textbook, and the test-maker. When we teach students to analyze not only the content but the questions in our classrooms, and when we teach them strategies for asking and exploring their own questions, students are more likely to engage in critical thinking and to take ownership of their learning. Standards: Though the ability to analyze and ask questions is an essential critical thinking skill, it is addressed indirectly in the Common Core state standards. Depending on the content and the nature of the task, the questioning strategies included here have the potential to address most of the standards for Reading Literature and Informational Text as well as some of the standards for Writing, Speaking and Listening, and Language. The authors of “It’s Time to Revise K-W-L” argue that the traditional K-W-L (what I Know, what I Want to know, what I Learned) chart, a popular formative assessment designed to help students connect prior learning with new knowledge, may inhibit authentic student inquiry. In its place, they propose the H-Q-Q Chart (what we’ve Heard about an issue or topic, what Questions we have, and after reading and searching for answers, what Questions we have about our new knowledge of the issue or topic). Column 1: Students work with a partner or in small groups to share what they have heard about a topic in the form of notes in first column. Column 2: Students generate questions about what they have heard in the second column and to work collaboratively to investigate their questions on the topic. This process “allows for a collaborative examination of deeply held misconceptions rather than the correction of shallow facts,” and encourages students to build on prior knowledge. It also provides a framework for students to explore conflicting ideas and to question their own misconceptions and values. H: What have we heard about the topic? Q: What questions do we have about the topic? Q: What new questions do we have? Also called Reciprocal Questioning, this strategy is designed to teach students to question a text as they read and learn. Used at the beginning of a unit or extended text, it can also provide teachers with an initial understanding of students’ background knowledge. Over time, this reading and questioning routine can be transferred to students working in pairs. Teacher asks students about the text. What is it? What are its characteristics, dimensions, features, and parts? What does it look like? What caused it? What changes occurred to create your topic? How is it changing? How will it change? What part of the changing process is your topic involved with? What may your topic lead to in the future? What is it like or unlike? What features differentiate your topic from others? What analogies does your topic support? What larger system is your topic a part of? How does your topic relate to this system? What do people say about it? What reactions does your topic arouse? What about the topic causes those reactions? What claim are you making about your topic? What good reasons support your claim? What underlying assumptions support the reasons for your claim? What backup evidence can you find for your claim? What refutations of your claim can be made? In what ways is or should your claim be qualified? The information in the first column can be used by students working in partners or small groups to analyze the types of questions published in a textbook, on a test, or in a teacher’s lesson plan. After analyzing the questions posed by others, students read a passage or listen to a presentation and practice composing their own questions in the second column. “On the Line” questions (also called comprehension questions) are text-based: the answers to these questions can be verified in the text. These questions often ask who, what, when, where, how? They are not debatable and everyone should have the same answer. “Between the Line” questions (also called interpretation questions) require us to read between the lines and to draw conclusions about the author, people, events, and ideas in the text. They require analysis and inference. These questions stay within the text and often ask why, how, and so what? The answers require reasoning and textual evidence; answers may vary. “Beyond the Line” questions (also called extension questions) use the text as a stimulus, but require us to extend and connect the text to ideas, events, and texts other than the one under discussion. The answers to these questions are often debatable, and reasonable people may disagree on the answers. Click here for the Levels of Questions Chart handout. What new model would you construct? 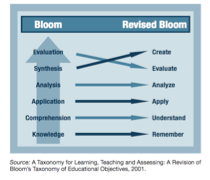 Click here for a user-friendly handout of Bloom's Question Starters. Before revealing the QFocus, allow 3-4 minutes for students to discuss the rules, guided by this template for discussing the level of difficulty. This step captures students’ interest and helps students to remember the rules.